I don’t know about you, but when I see invitations to Webinars with a duration of 2 hours, it makes me shudder. I think it’s important to put yourself in the position of the audience. Just think what it’s like to sit for 2 hours holding a phone to your ear. Maybe some of your audience will be doing this. What physical demands are you making on them? Even the most dedicated, passionate participants are likely to get physically exhausted in a long Webinar – even if they are simply sitting listening to a streaming presentation. Furthermore, if you want any kind of good audience interaction, this is going to be more difficult the longer the session. I’ve seen some research which has suggested that 40 minutes is the optimum length of time to concentrate on a particular task but I actually think depends on what you are doing. If you are engaged in what’s called a ‘lean forward’ activity like filling in a form or conversing via text chat, I think it’s possible to concentrate for musch longer than in a more passive ‘lean back’ activity. For example, a concert by the audience’s favourite artist or a TED talk on a favourite subject by a world-renowned expert may make a longer session much easier to cope with. Imagine the difference between attending a Webinar for a work reason or for one of your personal passions – they are not often the same thing! Of course one of the best ways of finding this information out is by asking for feedback from your audience on differing lengths of session. 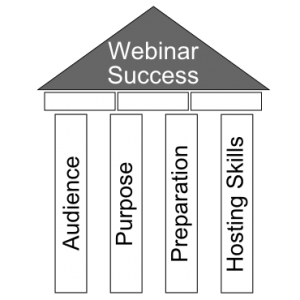 …knowing your audience and considering the purpose of the session are once again the most important factors when considering the length of your Webinar. Design and prepare the right length for both of these pillars with the right mix of activities. This will create a more effective Webinar and therefore a higher chance of creating fans who become repeat attenders because the length and style of the Webinar suits their needs and preferences.